We are announcing a New Product! I would like to announce the launch of a brand new product called HSMCode. HSMCode combines the power HSMAdvisor speed and Feed calculator, its advanced Tool and Cut Database and the new functionality of HSMCode into one seamless product! 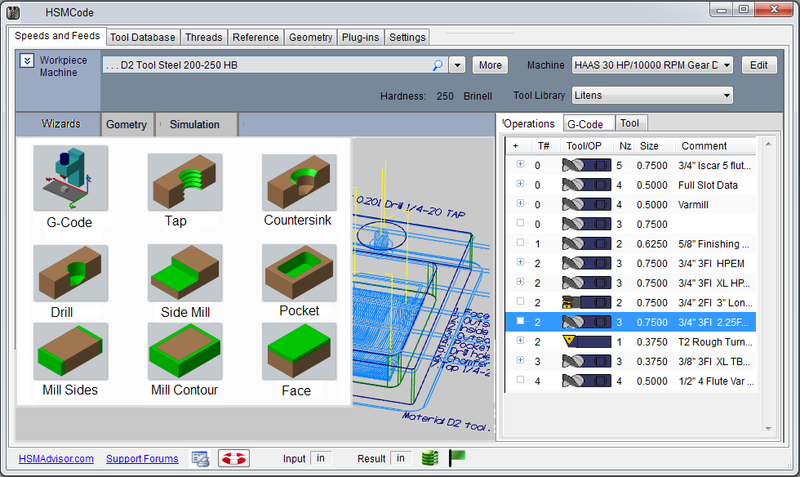 HSMCode allows you to create ToolPaths from imported CAD or Solid geometry with ease. You can also create additional geometry using an in-built CAD designer and Simulate your Toolpaths to verify the correctness of your work. The sales will begin in a couple of months on June 31 2016! Please contact me if you would like to test the early demo version, affect the development of the software and (depending on the value of your input) receive your Lifetime Subscription for free! I would love to test the early demo version! It sounds like a perfect candidate for my use case, being new to CAM operations. I'm familiar with CNC from using a 3D printer, which also uses gcode. But unfamiliar with feeds & speeds. I am already familiar with CAD, and already have made models for the prototypes I would like to use. Like I said in the email. HSMCode is being delayed for now. I needed to tend to more pressing projects.